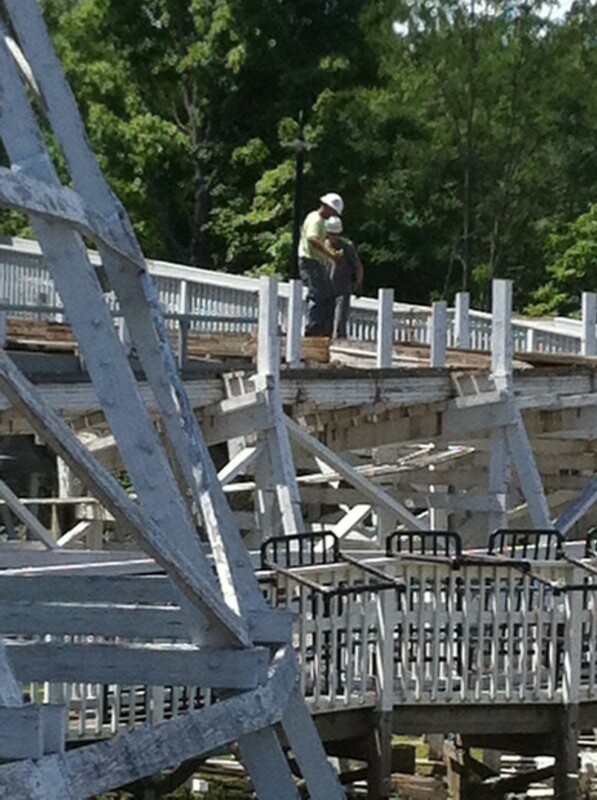 While the coaster has been closed for just one week, it’s time for our first Cyclone construction update! Our first construction update for Cyclone will be on the shorter side as we still don’t know for sure what’s happening to the coaster yet. We have a good idea, but we could be completely off base. 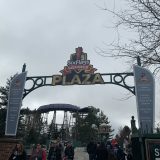 According to Dennis, all of the track immediately leaving the station has been removed. 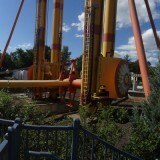 With Medusa and Rattler, this section of track were also the first areas to be removed. So this is further evidence pointing to the Iron/Steel Cyclone rumor being true. Dennis saw about ten workers at the site. 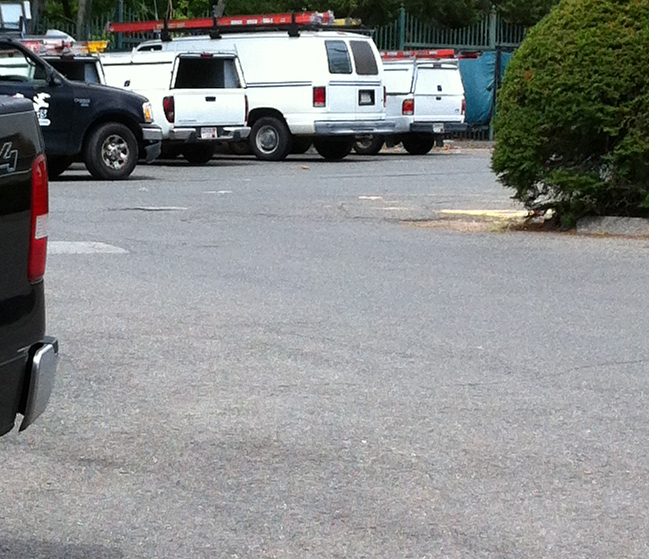 He speculates that the vans in the picture below must belong to the workers because those orange ladders were later seen on the site. 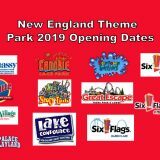 On a different note, we heard from several different people that there were some Rocky Mountain Construction vehicles seen leaving the maintenance area of Six Flags New England. This could mean everything or it could mean nothing. 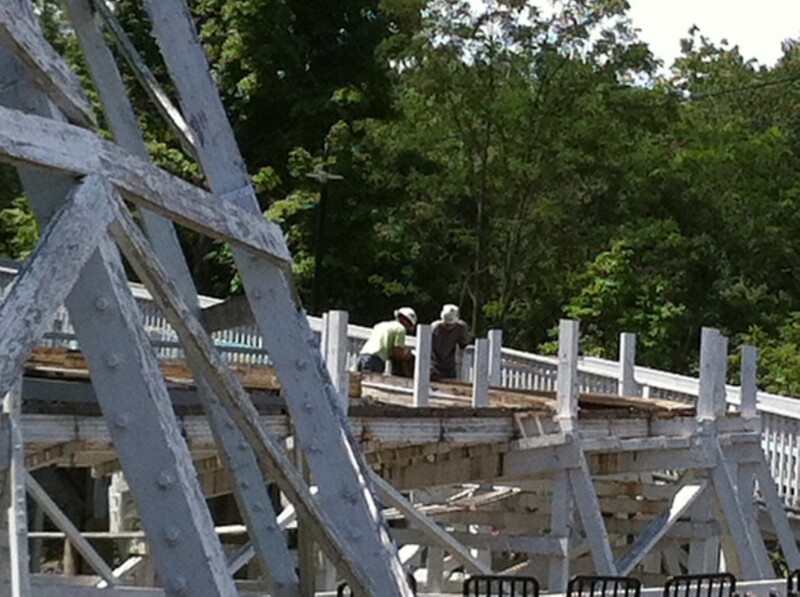 RMC could simply be assisting the park in removing the coaster. They are known for doing a lot of other things than just their renovations and wooden coasters. Here’s a picture of the workers doing something. Dennis also saw welding equipment on site. It appears as if they are watering down the track and then proceeding to cut. Definitely not something they would be doing if Cyclone was being removed completely. You can see a bit more of this process in the video below. You can notice the queue railings hanging on the exit ramp in this picture. The old storage cubbies in the station were also sitting on the exit ramp. Dennis spotted some other things as well that he couldn’t get pictures of: four or five small storage containers sitting in the old queue area, the trains are both removed from the site, plus a rented portable construction office. Here is a quick video Dennis took of the work being done. I do think it’s highly likely we will see the rumor turn out to be true. 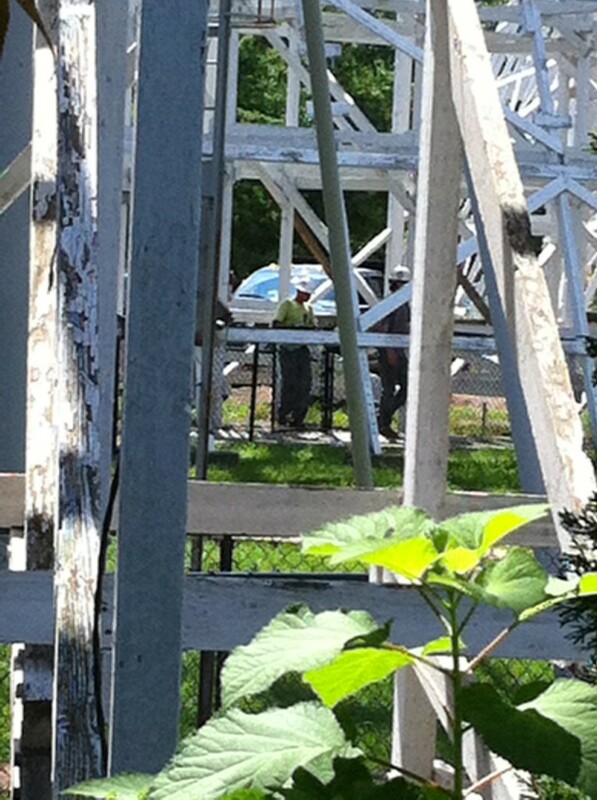 A lot of what’s going on around Cyclone is what happened to Medusa and Rattler after they closed. 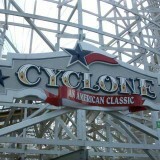 They probably wouldn’t be doing everything as carefully as they are if Cyclone was being torn down. 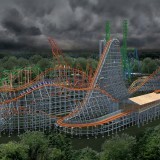 In fact, if it was being removed completely, Cyclone would probably look something like this right now. 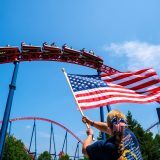 Whatever is happening, we’ll know for sure on August 28, when Six Flags makes their annual announcements. IAAPA Coverage Starts Next Week !!! Exciting! What do you think IC will be like? – The turn will be a bit like Iron Rattler’s helix – barrel roll, overbanked turn, steep drop. If any of the drops are steepened, a small hill or double-up might be added to avoid a flat section of track. 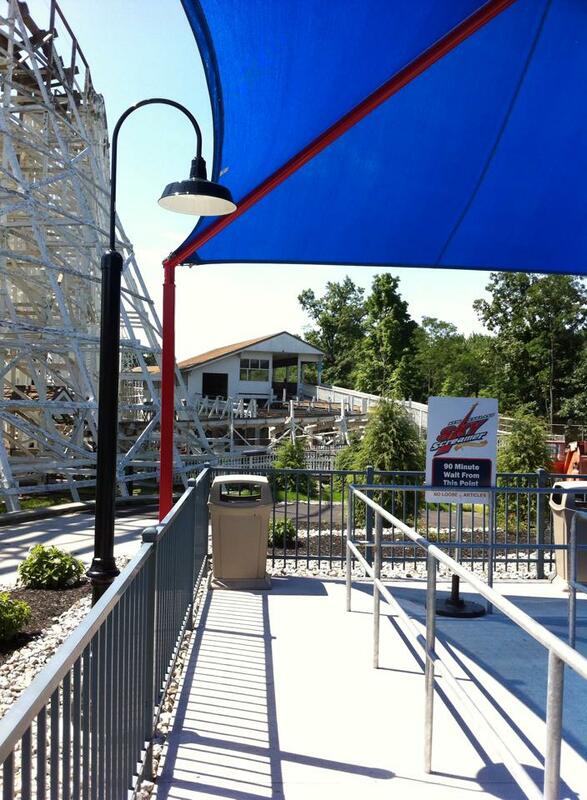 – The whole turn will be removed and replaced with a dive loop, meaning Cyclone will lose its “twister” status. 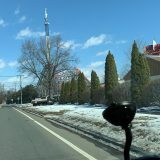 To be honest, I hope it doesn’t loose it’s twister status because the iconic shape of the ride would be lost and the landscape would be greatly affected. 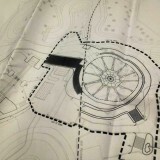 I think that the turn around will be similar to that of Iron Rattlers and will have banked turns and possibly a barrel roll.